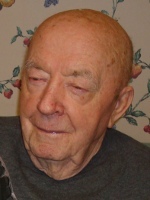 MARTINDALE – Laimonis Betins, 93, of Martindale hamlet, passed away peacefully on October 13, 2011 at St. Peter’s Hospital in Albany, New York. His wife Milda and loving family were with him. Laimonis was most recently a resident of Pinehaven Nursing and Rehabilitation Center in Philmont, NY. Born January 28, 1918 in Eleja, Latvia he was the son of the late Teodors and Elizebeta (Cimmermanis) Betins. Laimonis came to the United States as a World War II refugee in 1956 and settled in Babylon, Long Island with his wife Milda and their two children, Hans and Ilze. He worked for most of his life in the U.S. for General Builders, a housing construction company. Laimonis found great joy in vegetable gardening and his tomatoes, cucumbers and lettuces were the delight of his family, friends and neighbors. Laimonis is survived by his wife of 63 years, Milda (Jankowski) Betins who resides in Martindale hamlet, his son Hans Betins of Rehoboth Beach, Delaware; daughter Ilze Earner, also of Martindale hamlet; daughter-in-law Linda Betins, son-in-law Laurence Earner and grandchildren Michael Betins, Stephan Betins, Zigis Switzer, Maize Earner and Kristine Earner. He is also survived by two great-grandchildren, Ryan and Taylor Betins. In addition to his immediate family Laimonis is survived by his twin sister, Rasma Ence of Lakehurst, New Jersey. He was pre-deceased by his brother, Arvids Betins who died in the Soviet gulag. Interment will take place in the spring in Catskill, NY. Donations can be made to Pinehaven Nursing and Rehabilitation Center, 201 Main Street, Philmont, NY 12565. To leave a message of condolence for the family, please visit www.HansFuneralHome.com . My prayers and support are with all of you at this time. I am convinced that you moving him into hospice care allowed him to go to God in a peaceful manner. Rest in Peace ,vieglas smiltis Betin kungs. Sincere condolences for your loss and great joy for his life well lived. Looking forward to sharing the tears and laughs with you. My thoughts and love are with you and your family. May his mind and body return to him in the afterlife untouched by the ravages of time. I am so sorry to hear about your Dad’s passing. I know this is a very sad and difficult time for you and your wonderful family. You all are in my prayers. My condolences, I hope he finds peace. How very sorry I am to hear of the loss of your father. My deepest sympathies to you and your family. I know this is a very difficult time for you, and my thoughts and prayers are with you. May the love of those around you see you through it.